Your Tbilisi guide and driver will meet you at 9 am at the lobby of your Hotel. This one day tour will be held along the so-called Georgian Military Highway to the North of the country towards the border with Russia. 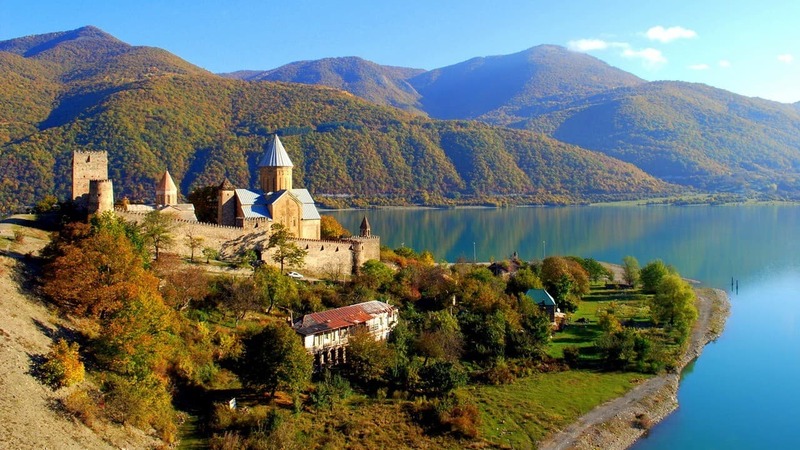 In about 70 kilometers you will arrive at your first stop of the tour – Ananuri fortress. In its own time this massive place used to be called “a key to the Aragvi river gorge”, and was a residence of the Eristavi Dukes. The tour will be continued to the village Pasanauri famous for its “khinkali” (Georgian traditional dumplings) and for the fact that here two small mountain rivers, Black and White Aragvi come together and form a bigger one – Aragvi river. You will driver further through the town of Gudauri and mountain “Cross Pass” up to the small town of Stepantsminda, otherwise known as Kazbegi. You will then change the vehicle for the 4WD one to take a short off-road drive up to the Gergeti Holy Trinity Church*. ​* – This can be substituted with the trip to Gveleti waterfalls instead.